Balkumbia is a multicultural project which started in Barcelona in Spring 2015, gathering musicians with various cultural backgrounds. As the name suggests, our main influences come from Balkan melodies and Latin beats. 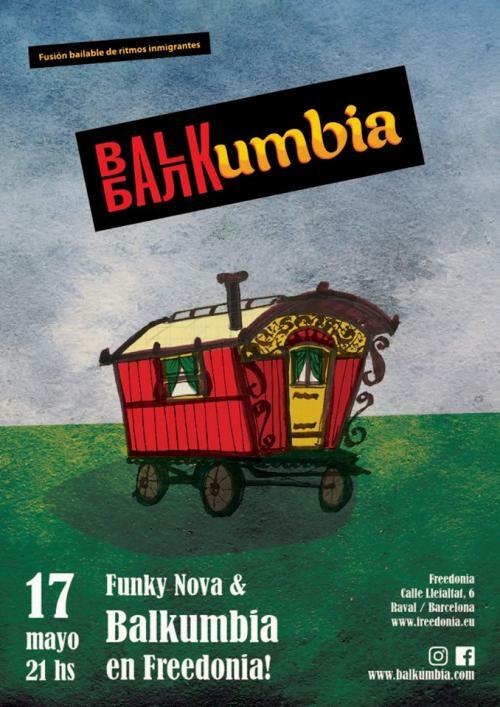 With its original “fusion bailable de ritmos inmigrantes” (danceable fusion from immigrant beats), Balkumbia presents a show that brings takes the audience to an imaginary trip through various countries of the world! We performed more than 100 concerts in 13 different countries (Spain, France, Italy, Greece, Serbia, Hungary, England, Chile, Lithuania, Latvia, Netherlands and Germany), including performances on in some of their biggest concert venues, as the Sala Apolo (Barcelona) or Hootananny (London).